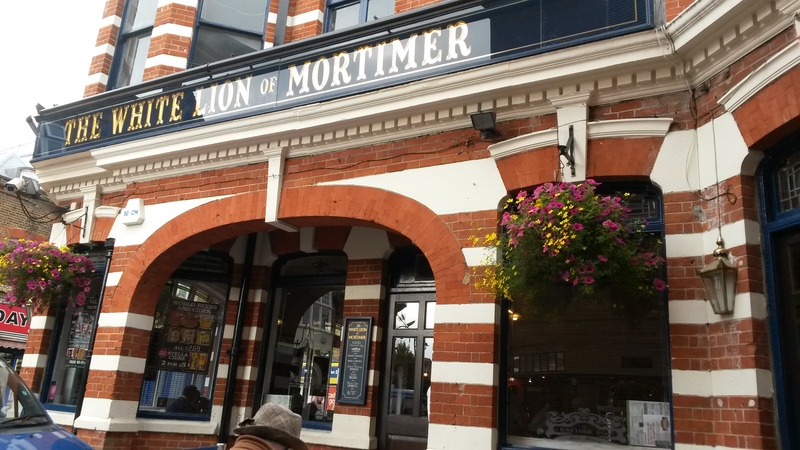 A few weeks ago, on a Sunday, we wandered into The White Lion of Mortimer, a pub in Mitcham. For those who like more details, it’s located at 223 London Road. It was in the afternoon and I was famished. Looking around, I wasn’t sure if I wanted to risk ordering food at this pub. The surroundings weren’t all that impressive. However, the back part of the pub had a lot of tables and all of them were full. And everyone was eating. That made me feel somewhat better so I ordered the Sunday roast. I should note that the meals at this pub are pretty cheap, which may account for the business. There were lots of beer choices, however I can’t remember what beer I had. I think The Better Half just ordered a couple of lagers—nothing too exciting. Our food arrived and I was surprised. I won’t say that it wowed me, but it was average. And there was a lot of it. If I was in the area again, I would pop in if I was hungry. However, I doubt I would seek this place out with the intention of having food. Unless I wanted something cheap and decent. Overall, I give the pub a solid three stars out of five. Nothing great about it, but I didn’t run screaming from the joint vowing I would never return. 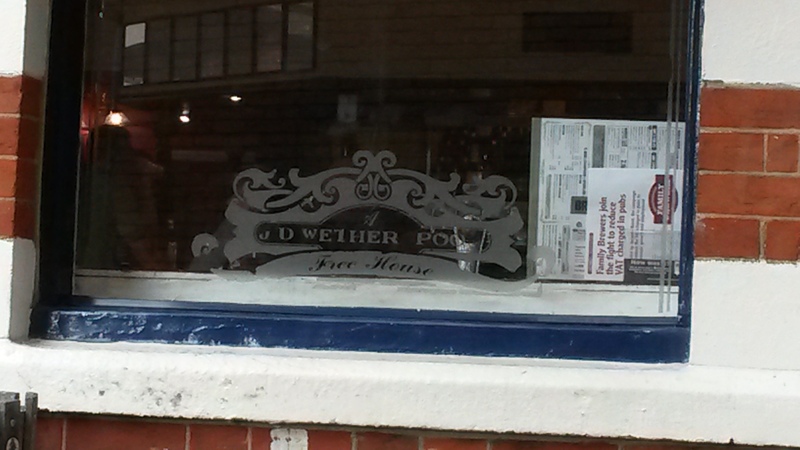 They may want to fix their window, since right now it says J. D. Wether poo, not Wetherspoon. I got a kick out of that. You may have to click on it to read it. This entry was posted in Pub of the Week and tagged England, Mitcham, Pubs, Sunday Roast, Surrey, The White Lion of Mortimer Pub. Bookmark the permalink. I could really fancy that plateful of roast right now! For under 7 quid! I think it was that cheap. Could be wrong–beer was involved. That’s not a bad price! Have you been up to East Finchley? The Bald Faced Stag does quite nice food, as does the Clissold Arms. love the name: Bald Faced Stag. Must seek out both of these pubs. Thanks! I’ll look past it and focus on the good: food and beer. Hmmmm…..that roast is giving me some ideas for what’s for dinner!!! Yummmmm. And yes—-they def need to take a look at relettering that sign. Nothing like a plate full of poo to turn folks away. I’m a sucker for poo jokes. Always makes me giggle. Ha ha, wonder it they left it that way on purpose. Yeah this may not be the pub for tourists. More of a local one with cheap food and beer. I’m a huge fan of comfort food. I know when I’m getting sick, since I start to crave pancakes. The building is beautiful. The surrounding buildings all have some charm and reminds me that I live in England. Diplomatic review, but I will not be catching a flight anytime soon to dine there. I think the “typo” in the sign was probably some shenanigans manufactured by a regular who was well on his way to getting three sheets to the wind — if he was not already there. I’ll try to find some pubs to tempt you to book that flight. London is a great town! And I can think of a few people I know who would manufacture the sign. There are many cheeky fellows here. Nice review, TBM. This looks like a place where one might pop in after a busy morning and have a good, old-fashioned lunch. Nice to know that you liked it. It surprised me and that’s always nice. Not a bad local. Have a wonderful weekend! Happy weekend to you too, TBM! the food looked right for a cool day…is it “bread” that looks like a little bowl??? That’s Yorkshire pudding. I copy and pasted this from Wikipedia: also known as batter pudding, is an English dish made from batter consisting of eggs, flour, and milk. 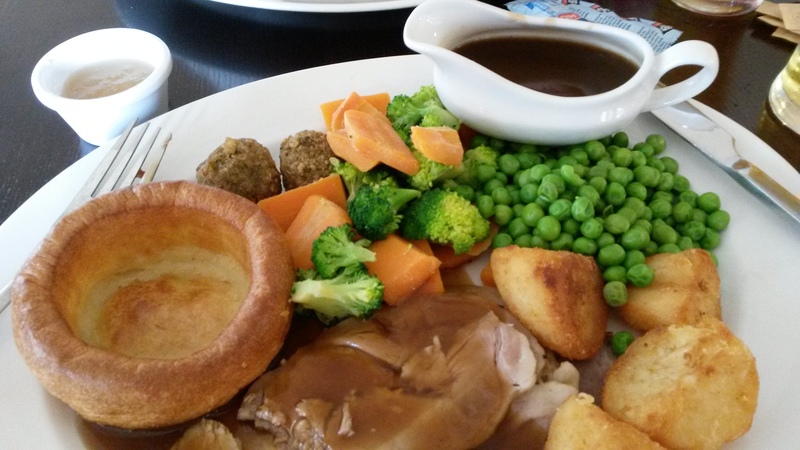 The dish is usually served with roast meat and gravy and is a staple of the traditional British Sunday roast. I love it. Hope you get a chance to try it. Definitely different from the traditional pubs with Old English ambiance. Yes … it feels more like a diner than pub. They love peas here. Put them with everything and it drives me batty. I’m not a fan. I’ve been away too long from reading your posts, TBM. I have a lot of catching up to do. No worries. I hope all is well. A roast and a brew sounds good! It’s dinnertime now, so I’m hungry. I love a hearty meal. Makes me feel like I’m having a home cooked meal. I’m not much of a cook myself, so this has to count. Hope you had a lovely dinner. This building looks nice on the outside, and I really like bricks. The food doesn’t look too bad either, I wanted to ask about the thing on the left but I saw from the other comments it’s a pudding. At first I thought it was a giant mushroom. that would be a big mushroom! When I was a kid I tried Yorkshire pudding and loved it. But since I lived in the States, I didn’t get it a lot. Now I can have it whenever and I love it! I enjoy a Wetherspoon’s roast every now and again. They used to serve it any day of the week, but it’s only available on Sundays now. 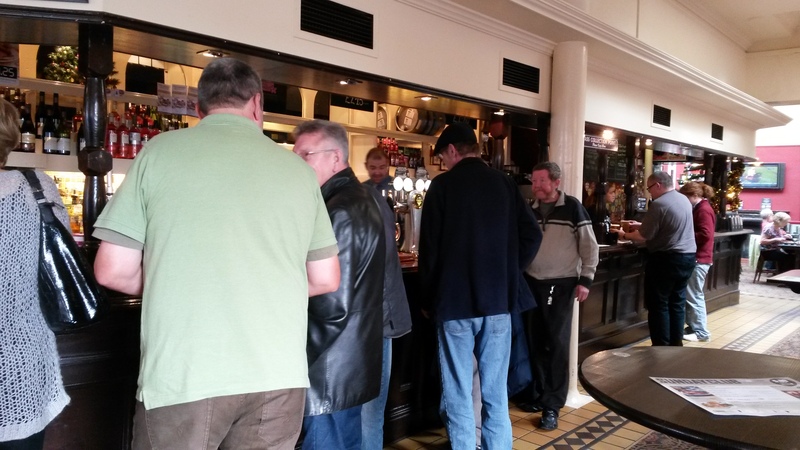 I’m surprised you opted for lager, because Wetherspoon’s normally have a very good selection of real ales on offer.